Middle Street in San Pedro is the hustle and bustle core business area of town. 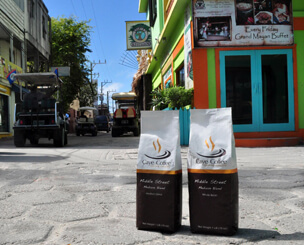 Our Medium blend is a combination of our Front Street and Backstreet roasts, blended to capture that full coffee taste with a slightly bold bite at the end. Middle Street Medium has more body than the lighter Front Street roast, yet, it still delivers that great flavour as you make your way through the day. We like this blend over ice as well!! !